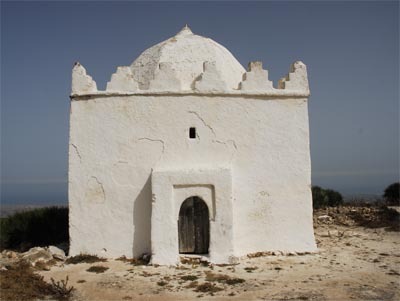 At the summit of Jebel el Hadid, the tomb of Sidi Ali Saih (Saïeh-the wanderer) was said to be a retreat and prayer for the seven saints. 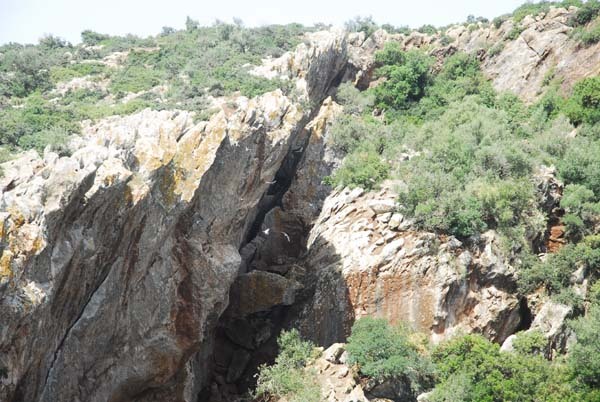 Jebel Hadid, sacred mountain of Regraga, cutting the territory into two parts Chiadma. Local residents are themselves a distinction between the Sahel, the coastal strip west of this mountain and Kabla the continent to the east. Compared to the geographical layout, the symmetrical distribution of the seven saints is remarkable: the summit of Jebel Hadid, the center of spiritual influence of Sultan Sidi Ouasmin; three saints in the Sahel on the one hand and three on the other Kabla . The ores of iron are found in impure states, often oxidized and mixed in with silicates of other metals.During smelting, when the ore is exposed to high temperatures, these impurities are separated from the molten metal and can be removed. The collection of compounds that is removed is the slag. 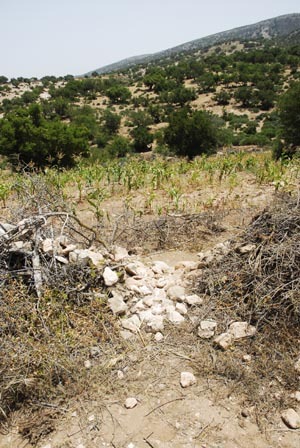 Piles of slag from iron production can be seen in Ain Lahjar - just som kilometers south of Jebel Hadid. In the map we can see the hillsides and the plateau of Djebel Hadid. The iron mine and the Tomb of Sidi Ouasmin is marked. well as with fresh water. The wells are not more than 4 meters deep. 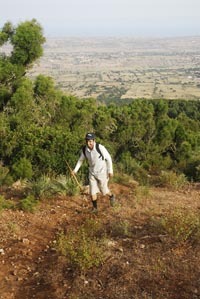 on the north side of Djebel Hadid at an altitude of 658 m.
Show the map Essaouira - Marabouts and Zaouias bigger! 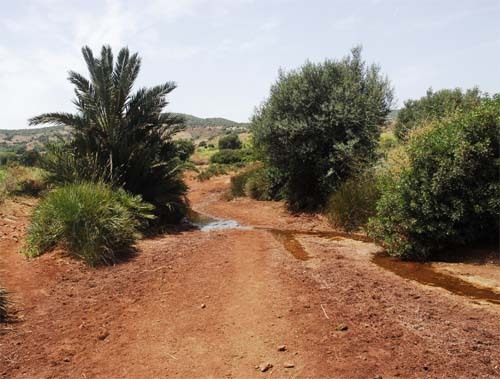 There are no roads leading to the shrine of Sidi Yacoub. is from the Had Dra - Akarmoud road. From most directions it is easy to navigate because you can spot its silhouette on the hilltop. Winter - floods from oueds. Summers occationally hot and windy. 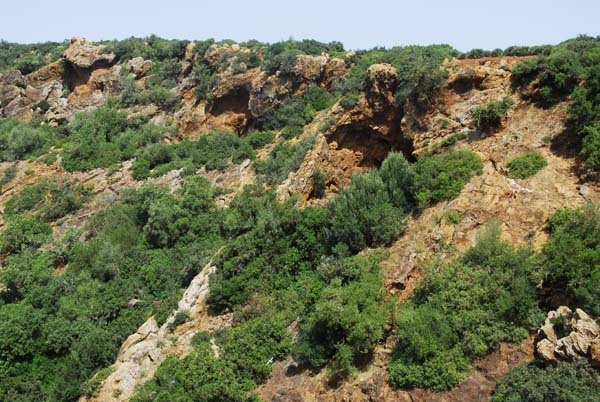 Beautiful forested landscape and scenery.Argan and Thuja trees. Plants. Birds. Clear days you can see Had Draa, Ain Lahjar,Moulay Bouzerktoun, Bihiba, Akarmoud and the Atlantic Ocean at a distance from this summit of Djebel Hadid. Bring water bottles because you can only find rainwater to drink on the top. 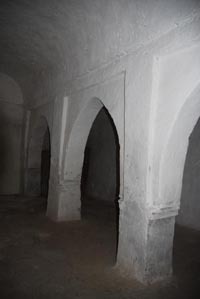 The site has also a mosque and a visitors room. A family is living just near on the north side of the shrine. There you can find the Attendant Abdelkader. 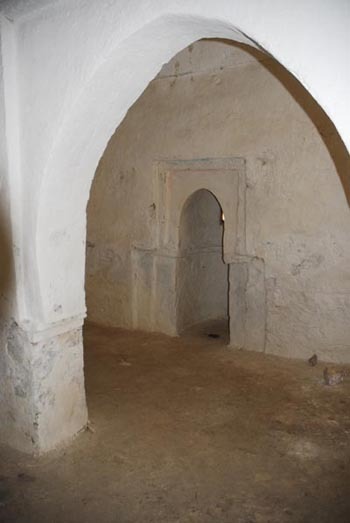 He is looking after the old buildings,without any funds, invite visitors for tea and and give food to the Regraga when they once a year, visit the Tomb Sidi Yacoub on their douar. There are a lot of wild boars but you see them only in the night. 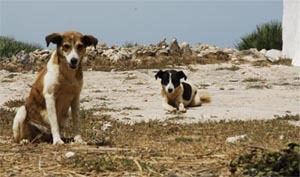 They eat the crops cultivated on the hillsides. 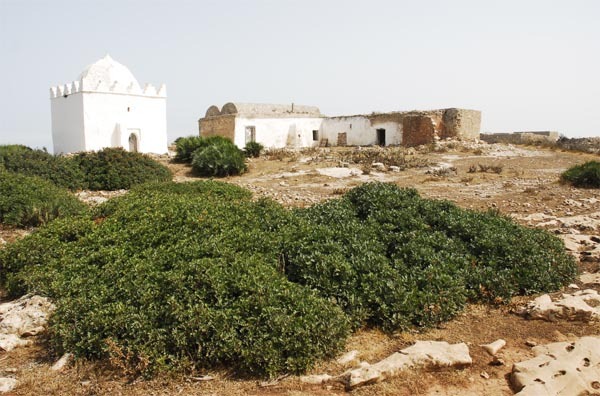 Sidi Yacoub was a fqi -teacher of Al Koran from Faida a village south of Djebel Hadid. 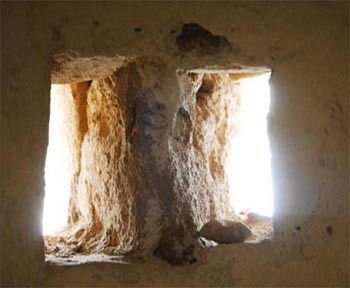 When he was ready to die, he asked his family to bury him on the hilltop where he lies now. He also said that someone else would come in his place. 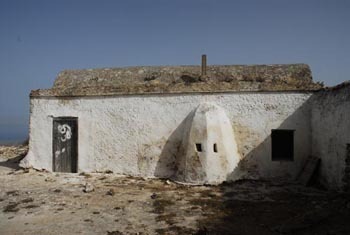 300 years later Sidi Ali Saih came and he is buried in the shrine beside Sidi Yacoub. It is also said that this place has been in use for over 900 years. This site could be an ancient place of worship before the Islamization of the region Chiadma. The grave should be aligned perpendicular to the Qiblah (i.e. Mecca). The body is placed in the grave without a casket, lying on its right side, and facing the Qiblah. The Qiblah (Arabic:"direction"), also transliterated as Qibla, Kiblah or Kibla, is the direction that should be faced when a Muslim prays during salah. Most mosques contain a wall niche, known as mihrab, that indicates the Qiblah. Shrine; a structure or place memorializing a person or religious concept. Tomb: A tomb is a repository for the remains of the dead. 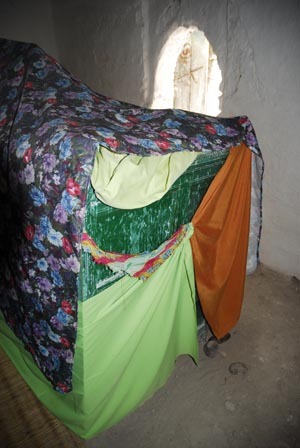 It is generally any structurally enclosed interment space or burial chamber, of varying sizes. 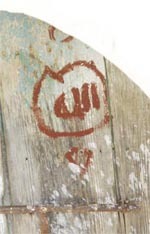 The name of God, Allah, painted on the entrance door to the tomb of Sidi Yacoub and Sidi Ali Saih. Koubba: Koubbèh (from Arabic koubba = dome, cupola). - Monument erected on the grave of a revered figure, or in a place where he stayed. 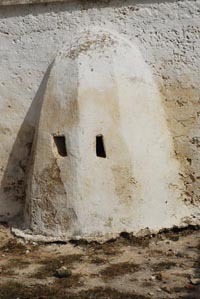 The koubba, which occur mainly in North Africa, consisting of a cubic part surmounted by a spherical dome or arched, sometimes decorated with a crescent, and their size rarely exceeds 4 meters square, and some of them present in their interior a little room where you can find shelter. Bathing the dead body, except in extraordinary circumstances as in battle of Uhud.